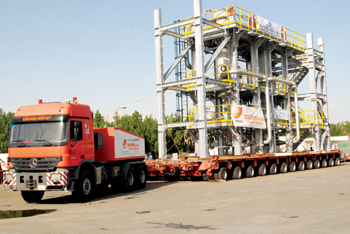 Almajdouie Logistics has added one more laurel to its many accolades in recent years. Frost & Sullivan recognised Almajdouie Logistics’ achievements in continually enhancing services, meeting clients’ expectations and introducing the latest technologies in the industry. The event hosted global C-level participants, senior analysts and exclusive invitees who discussed business developments, future technologies and mega trends impacting industries. Baheej I Al Beqawi, CEO of Almajdouie Logistics, traced the origins of his company to 1965 when Shaikh Ali Almajdouie founded the enterprise with a single truck while simultaneously providing customs clearance services. “The story seems more and more like a distant memory in the face of increasing developments leading to our diverse and integrated logistics and supply chain services not only in Saudi Arabia but also across the GCC,” he asserted. The company said this new award further strengthens its determination to deliver innovative and reliable services and exceed clients’ expectations. A highlight of 2015 was outsourcing by Sadara of its solids packaging centre activity to MdR, a JV between Almajdouie Group and De Rijke Group. MDR is managing all on-site logistic operations, such as unloading of raw materials, internal transport, packaging and storage of finished products, loading of finished products and handling of containers and cargo for railways. Almajdouie also has a hand in the logistics side of Ma’aden Aluminium where its services include transportation and warehouse management. The company has provided logistics services to Sabic and other pivotal companies in diverse fields. Some 60 per cent of its business comes from handling logistics for the petrochemical, oil and gas industries, 20 per cent for FMCG and 20 per cent for others. 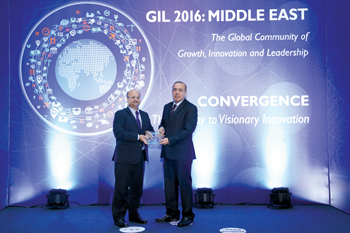 Aroop Zutshi, global president and managing partner, Frost & Sullivan, presented the award to Beqawi.